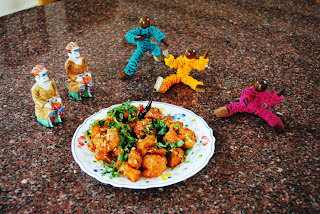 Time,Time..I have all the time --: How About Some Chinese For Lunch? A simple Chinese meal, here are some pictures. 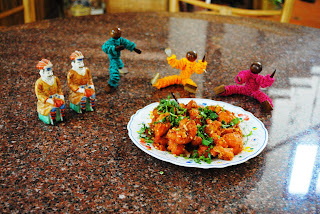 The Cauliflower Manchurian looks very red, but believe me, I did not add red color like they usually do in the Restaurants. The color is from MDH Theeka Lal (a brand of Masalas, in this case: their red chilly powder). It would have tasted much better if I had used Spring onions for the garnish, since I did not have them, I had to make do with just fresh coriander leaves. How about you, do you like Chinese food? 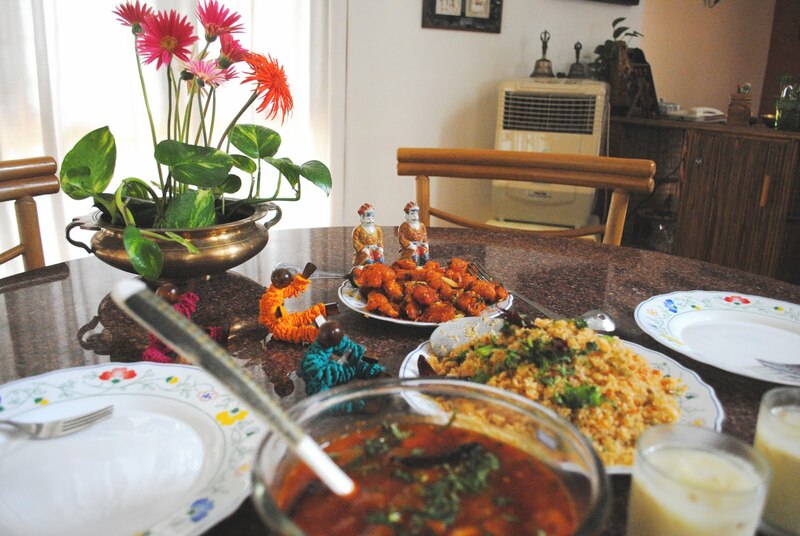 Ha, ha, I love the guests sitting down for the meal:):) Rama, I love Chinese. Growing up in Malaysia, as a kid I used to spend more time at my Chinese friends home than mine...and eating with them:):) Looks delicious! Rama, my mouth is watering right now! Totally LOVE chinese food...esp. the Indo chinese food. Yours looks so yummy! 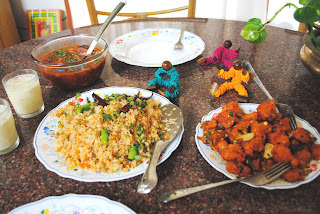 growing up, the first exposure to international food for me - CHINESE...manchurian is my all time fav...:). i m craving for some chinese right now!! The food looks scrumptious .For beautiful color i too will try Teekha Laal for my tandoori dishes.Thanks for the tip.I do love Chinese cuisine but the version we get in India. Indian chinese is my fav. it looks delicious. 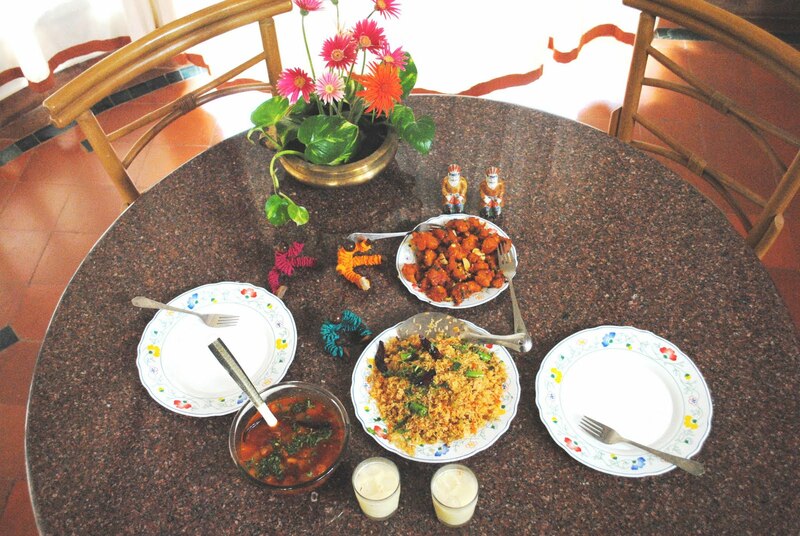 I know you are in Blore, when I was there Chungwah(not sure spelled correctly) was my fav restaurant. one in near Brigade rd and one in koramangla. I like Indo-Chinese food we get in India. Even though there are many restaurants here, I don't like any that serve Indo-Chinese. 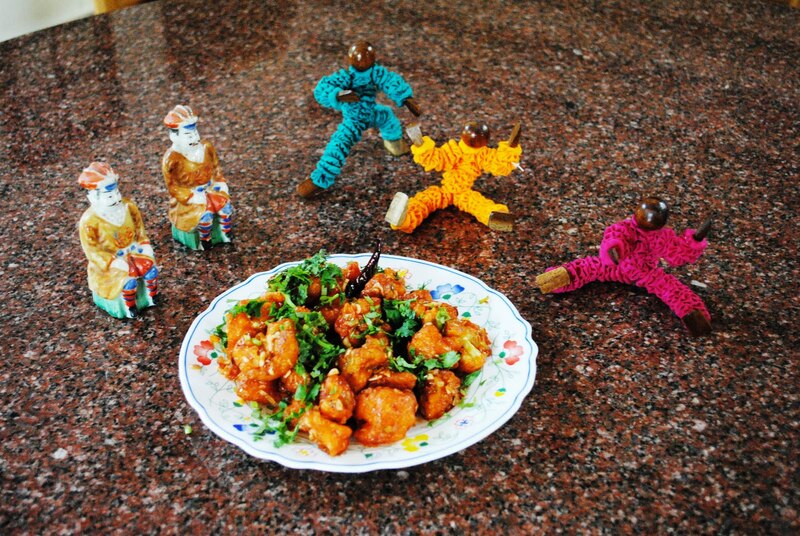 Manchurian and chop suey are my favorites. I love y0our table decor ,those three rascals:). I dont like chinese at all,chinese and thai are two cuisines , I dont like. I love Chinese food. I also enjoy cooking noodles, fried rice, manchurian etc. at home, and I stay away from artificial color too. You could also try Everest Kootilal or Kashmiri red chilly powder for the beautiful color. I use it for my chicken tikkas :).The Tikhalal of Everest brand is very hot. I haven't tried the MDH variety. delicious! well presented!! Don't be surprised if I land at your place to polish off those treats. Wow I'm drooling. Cute pics.I love Chinese food..minus the MSG. I LOVE Chinese food . 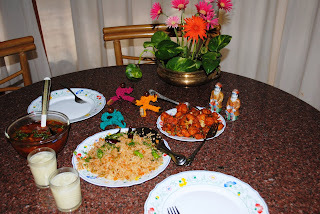 In my college days my best friend was Chinese and in the lunch time I used eat up her food everyday. So much so she started bringing 2 lunch boxes. I stayed in the hostel - understandable isn't it?